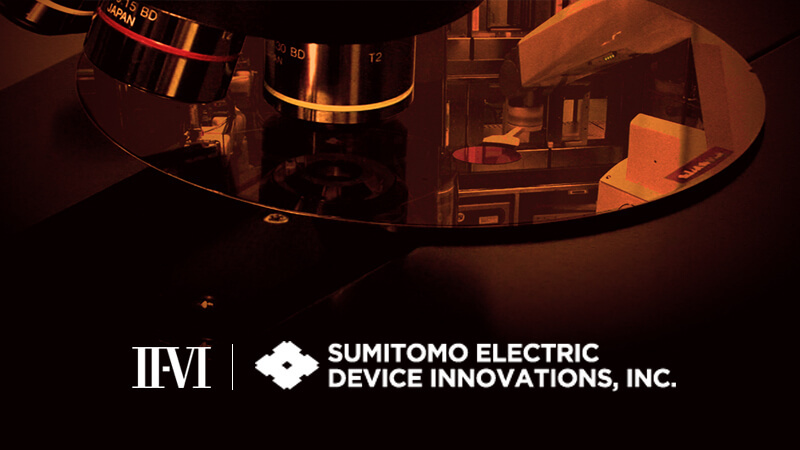 II‐VI Incorporated (NASDAQ:IIVI), a leading provider of compound semiconductor solutions, today announced a strategic collaboration with Sumitomo Electric Device Innovations, Inc., (SEDI) a subsidiary of Sumitomo Electric Industries, Ltd. (TYO:5802), to establish a vertically integrated, 150 mm wafer fabrication platform to manufacture state-of-the-art gallium nitride (GaN) on silicon carbide (SiC) HEMT devices that will enable next generation wireless networks. “We are excited to collaborate with SEDI, the market leader in high-performance gallium nitride HEMT products for wireless communications. This collaboration establishes a differentiated, vertically integrated value chain solution that spans from substrates through RF modules,” said Dr. Chuck Mattera, President and CEO, II-VI Incorporated. “Coupling SEDI’s industry-leading HEMT device technology with our 150 mm manufacturing platform will accelerate both companies’ wide-bandgap RF product roadmaps, as well as secure a leading technology and market position for many years to come. To be ready for the mass production ramps, we are preparing a 150 mm semi-insulating substrate manufacturing platform and expanding our Warren, NJ Device fab to add these core technologies to our growing optoelectronic device fab capability.